Centenary United Methodist Church, 300 S. Central Ave. (at Third Street) in Little Tokyo, will hold its annual Arigato Bazaar on Saturday, May 4, from 10 a.m. to 6 p.m. The things at the Arigato Bazaar that people return year after year for include Centenary’s teriyaki barbecue chicken, manju, sushi, udon, Chinese chicken salad, teriyaki beef bowl, and homemade baked goods. Other food favorites include Spam musubi, cha shu bao, shaved ice, and gourmet hotdogs. The $1,000 grand prize drawing and hourly prize drawings, silent auction, handicraft gifts, and country store also brings people back every year. 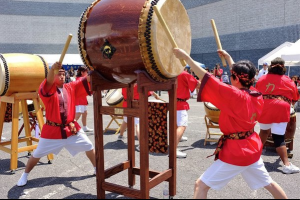 Bazaar entertainment programming will have the traditional favorites such as Centenary’s Chikara Taiko drummers at 2:15 p.m., karate demonstrations by Matsubayashi Shorin-ryu of Little Tokyo (based out of Centenary) at 12:30 and 1:30 p.m., and various music groups. New for this year, there will be free games to enjoy throughout the day. All ages will be welcome to play and win prizes. A unique addition is Centenary’s first anime/cosplay contest. Prior to judging at 3 p.m., costumed participants will parade through the bazaar led by a live marching band. This is a free event. Many prizes will be given out, including cash prizes. Centenary will host its second “Dance-Off” at 3:30 p.m., also with cash prizes. In this open contest, dancers will be challenged with the “Electric Slide,” “Cupid Shuffle,” “Macarena,” “Cha-Cha Slide,” and many other popular dances thrown at them within a 15-minute period. Bazaar programming will end with Centenary’s third public Odori/Ondo event at 4 p.m. Dancers dressed in kimono, yukata, and happi coats will form circles and dance to traditional Japanese music as well as pop favorites from Michael Jackson, Lady Gaga, Marvin Gaye and the Beach Boys. All are encouraged to dance; no experience necessary. The Odori/Ondo is just before the beginning of the Buddhist Obon season. Many of Centenary’s neighboring Buddhist temples as well as local community groups will join in the dancing, making this a true community event. Parking will be available at the 420 E. Third St. Medical Building. The entrance to lot is on Boyd Street. Shuttle service will operate between the church and the parking lot. For more information, visit www.centenaryunitedmethodistchurch.org/ or the church’s Facebook page.